So you’ve created a video game. Naturally, you’re proud of the result after months of all-nighters spent programming and debugging the source code. Your game includes ideas, puzzles, game concepts, and user interfaces that no game has ever had. You’ve created artwork and graphics that are sure to enthrall even the most skeptical of gamers. Your game is most assuredly destined to be Game of the Year! Too bad someone stole it and published it before you did. All your “guaranteed” profits gone in a flash. But that’s ok, because software is or at least should be free to copy, right? By becoming a software developer you have automatically bought into the notion that software should be open source, right? Who needs to be fairly compensated for their efforts when ramen noodles are 3 for $0.99? You disagree? Ok, if you are actually upset that someone would copy your work, and want to know how to stop them from such illicit behavior in the future, read on. This article discusses the basic types of intellectual property – patents, copyrights, trademarks and trade secrets – and how to use them effectively to protect your video game. With a little advanced planning and basic knowledge of intellectual property, your video game will be protected … at least from a legal perspective. Patents, copyrights, trademarks and trade secrets each serve to motivate innovators to create new and exciting games by providing various protections for their efforts. For example, the patent system encourages innovation by promising inventors a short period of exclusivity if they come forward with their inventions. Without copyright protection, there is little incentive for authors and artists to create new creative works, because they naturally would be hesitant to create works that others could copy willy nilly without compensation to the artist (those ramen noodles sure are tasty, huh?). Trademarks help ensure that the name you’ve made for yourself stays yours. And finally, trade secret law helps those who decide to keep their technology secret, like the famously secret formula for Coca-Cola®. The discussion below is a short walk through these forms of intellectual property. Trademarks protect the goodwill and reputation associated with your company or video game as a brand. A trademark – any name or symbol indicative of a source of origin of a product or service – is arguably your most valuable business asset, and is perhaps also the most recognizable form of intellectual property. You can hardly drive down a major road without encountering a sign for a McDonalds® restaurant, a Coca-Cola® soda, or Nike® shoes. Many consumers purchase goods and services based on name recognition alone, e.g., EA or MADDEN. There are two ways to protect your trademark from being copied. The first is through state trademark laws. Each state offers trademark protection based on the use of the trademark in that state. The second more common (and more effective) way is to register the trademark with the U.S. Patent and Trademark Office (USPTO), which provides protection throughout the United States. Registered trademarks offer advantages over non-registered trademarks, and allow you to use the ® symbol. Once a trademark is registered, no other entity can use any name or mark that is identical to or is likely to cause confusion with your registered trademark anywhere in the U.S.
An exception arises where the other entity proves that it was using its trade name or mark prior to your trademark registration, in which case the other entity might have limited rights to use their name or mark in their geographic location. How does this affect your video game? Your trademark serves as a source of origin for your game. It is your reputation, your lifeblood. You want gamers to hear your name and know that the game is going to be phenomenal. Without trademark protection, someone else can adopt the same name as you to produce games. However, you have no quality control over their games, and they could ruin your public reputation and the goodwill you have worked so hard to create. Trademark registration is relatively inexpensive (current registration fee is no more than $375 per class of goods and services), and is typically the first form of intellectual property protection any venture formally secures. Copyrights are the second form of intellectual property, and protect the expression of an idea (but not the idea itself). 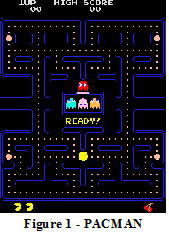 Take Pac-Man, for example. Copyright protection protects the actual artwork and sounds in the game as an audiovisual work, and the underlying source code as a literary work. No one can copy the actual images and sounds used during the game, illustrated in Fig. 1, or the underlying program. 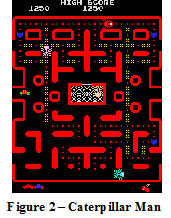 However, copyright does not protect the idea of a player controlled character eating dots in a maze-like game board while being chased by differently colored evil characters such as the caterpillar game shown in Fig. 2. Copyright protection exists the moment an author fixes an expression in a tangible medium. This means the moment you save your source code to disk, or you sketch out the artwork for your game character or level art, you automatically have copyright protection without doing anything further. An author can also choose to register the copyright with the U.S. Copyright Office (current registration fee is $45), which provides certain additional benefits, such as the right to statutory damages for copyright infringement. Copyrights were historically regarded of as the only form of “substantive” intellectual property protection for computer software, but that couldn’t be farther from the truth. Patents – the third and most diverse form of intellectual property – protect inventions from being copied. An invention is any new and useful process (e.g., game play methods, graphics techniques, user interface communications), machine (e.g., a computer programmed with computer software), article of manufacture (e.g., a disk or storage media on which software is distributed), or composition of matter, and also includes new ornamental designs (e.g., icons, user interface artwork, characters, etc. ).1 Patents can be thought of as protecting ideas, whereas a copyright only protects a particular expression of an idea. All patents include a description of the invention as well as one or more “claims” that define the legal metes and bounds of your invention (similar to physical boundaries of real estate that a trespasser must stay out of). Determining these bounds accurately is important, because a patent provides a limited but powerful monopoly on what is claimed, and prevents for a limited time anyone other than the patent owner from making, using, selling, or importing an item, or performing a process, that is encompassed by the claims of the patent (such an act would be considered patent infringement). A claim drafted too broadly may be invalid for attempting to encompass what is old or obvious, while a claim that is too narrow may be ineffective against competitors making minor modifications to your invention. Once a patent issues, the patent owner may negotiate a license with competitors who are practicing the invention, or sue for an injunction and/or monetary damages. Because claims are generally drafted to encompass something broader than a specific commercial product, patents can provide broad protection against competitors who copy your idea but make minor changes in an effort to avoid the patent. an item may be entirely original, but if the novel elements are functional, the item cannot be copyrighted: although it might be eligible for patent protection. The trackball system of operating the game is not subject to copyright protection. Functional features, such as the trackball system, might, at least potentially might, be eligible for patent protection. 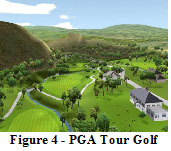 Had Incredible Technologies sought patent protection for the method by which a player uses a trackball to swing a golf club in Golden Tee, or for a machine programmed to provide Golden Tee’s specific interactive style, the outcome might have been different. However, patents can be expensive to obtain, often costing tens of thousands of dollars by the time the patent gets issued. The fourth form of intellectual property is perhaps the easiest to protect. A trade secret is basically all its name suggests – a piece of information that you keep secret. Each state has its own trade secret law, usually as part of its laws against unfair competition, but the requirements are generally the same: a trade secret is information that has business value, that is kept secret, and which was taken without permission. The most common form of trade secret misappropriation occurs when former employees of one company go to work for a different company, and take with them information (e.g., customer lists of registered game players in a virtual world, manufacturing techniques or tools such as unreleased in-house software used to create game levels, etc.) that the first company tried to keep secret. For your part, if you have developed in-house information that is of value to you, and you want to protect it as a trade secret, all you have to do is take reasonable precautions to keep it a secret (e.g., controlling access to the information, having employees agree to keep secrets, well, secret). Each form of intellectual property has its advantages and disadvantages. Patents provide the strongest protection, but are the hardest to get (and most expensive), and remain in force the shortest amount of time (usually about 16-18 years). Copyrights are easier to obtain (and less expensive), and last a long time (at least 70 years), but have the narrowest scope of protection (only your specific expression is covered). Trademarks last as long as you keep using the mark, but do not prevent anyone from copying your games, and trade secrets last as long as you can keep a secret. The strongest approach is certainly to pursue all four as appropriate, but don’t overlook the benefits of even one or two forms of intellectual property protection when budgets are tight, because intellectual property is often the lynchpin of a company’s success. 1 A third type of patents, which protect asexually reproducing man-made plants, are not discussed in this article. 2 Techs., Inc. v. Virtual Techs., Inc., 400 F.3d 1007 (7th Cir. 2005). That will be the only case cite in this article, we promise.